I knew I would like The Vall de Núria (Valley of Núria in English) as soon as I heard that the only way to get there was by rack railway or by foot. No roads=bliss/joy/nature (take your pick of adjectives). What I didn’t realize was how much I would like it. The Vall de Núria is stunning! And this is coming from a girl who grew up near the Rocky Mountains in Canada, so believe me, I know my mountains! There are so many hiking trails to choose from but when Simon, also an avid hiker from Wild About Travel, suggested that we hike the Old Road (Pel pont de Cremal) back down instead of taking the train, I didn’t hesitate. 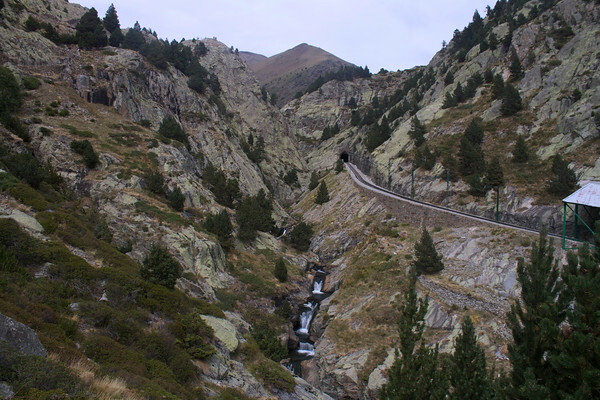 The scenery of the Vall de Núria is gorgeous but in my opinion is experienced much better while hiking than by train. Isabelle of Diaro de a bordo soon joined us. She had done it before but was eager to do it again. We grabbed a quick bite at the self-service restaurant (I would recommend bringing your own lunch) and were off. There are three variations to the Old Road, but we choose the classic version. It follows the valley for 7.7 km to the town of Queralbs where we were to catch the train and meet up with the rest of our group. As we did the descent from Vall de Núria to Queralbs it was easy hiking and took us about 2:30 hours, faster than the 3:20 hours recommended hiking time. The ascent (which we didn’t do) would have been more challenging. It’s over 900m of elevation gain. The official recommended hiking time for the ascent is 3:45, but it could be done faster if you were hiking at a steady pace. 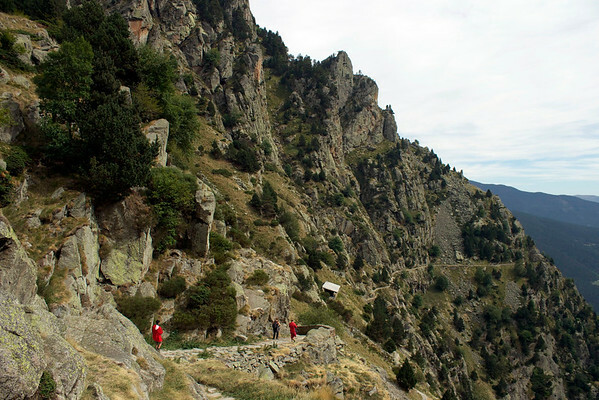 I LOVED hiking the Old Road from Vall de Núria to Queralbs! There were views the ENTIRE way. It was well signed. Everything you could want in a hike…except that now I want to experience it in winter… and do more hiking in the Pyrenees! Accommodation is available at Vall de Núria. A 1 day package including a return trip on the rack railway, a cable car ride to a peak and a self-service lunch is available for 41.35€. One way train tickets are also available. Vall de Núria is located just over 100km NW of Girona. 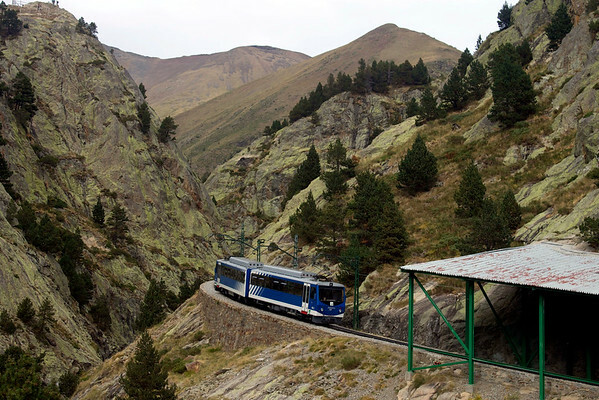 Check the Vall de Núria official website for train times and hiking maps. See Vall de Núria on Google Maps. Thank you to the Costa Brava Tourism Board for their hospitality. As always all opinions expressed are my own. I fell in love with Vall de Núria completely on my own. Next postWould You Try the Malolotja Canopy Tour in Swaziland? You and your crazy hiking trips...! I have to discover more mountain destinations in the future, the scenery is different but lovely. @Zhu - This one wasn't crazy (really) and since we only did it going down, it was easy, but the views were incredible. I wish I would have brought my sneakers so I could have hiked with you! Vall de Nuria was gorgeous. Did you see on their Facebook page, they posted a picture and they already have snow? @Jennifer - I wish you could have come too. I'll have to check out their FB page, I haven't seen the photo with snow, but it must be incredible. I've always wanted to hike in the Pyrenees. Lucky you with so much at your fingertips. One day yet Laurel we'll pull off a hike together. This one does sound lovely. I find it interesting how they mark the trails in hours and not miles in Europe. After a while I actually got used to it and liked it. @Leigh - Yes, we definitely do have to do a hike together. I find the markers funny as well, but I like it too since they account for elevation, which the km signs don't. @Calogero Mira - Agreed, we took the train on the way up and it was a beautiful journey. @Laurence - Agreed, it was a perfect day! @Josie - Completely agree. I highlyg recommend it. Safe travels to you as well. Now that looks like an incredible place to hike - your photos are beautiful!! @Lisa - Thank you and most definitely. I hope to have the opportunity to do more hiking there. Looks very pretty, Laurel. Probably the better day trip of the two, that. @Andrea - I would love to visit the Pyrenees in winter, I can imagine how enchanting it would be. Great stuff...I had no idea the Pyrenees were so rugged! @D.J. - Me neither, I was seriously impressed! 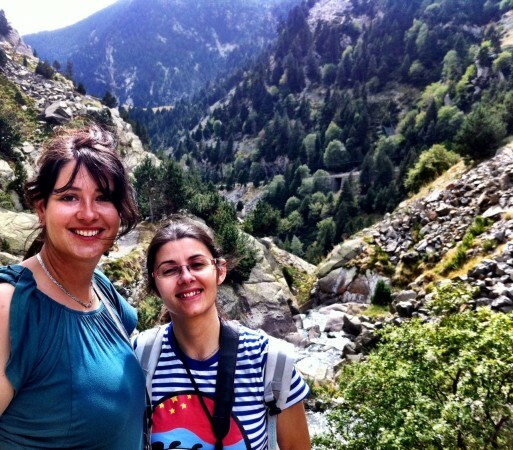 @MadaboutTravel - Thank you and I agree, hiking is definitely the best way to discover Vall de Nuria. I hope to come back and explore the area more. Looks like a lovely experience surrounded by a wonderful scenery! I love hiking in the Pyrenees! Last time I was there we battled through knee-deep snow in one section - it was so beautiful. Looks like a great hike, Laurel. It would be great to arrange a bit of hiking with you when I am in Europe next year if you are keen? @Martin - Thanks for the recommendation, I would love to do more hiking in the Pyrenees and it's always good to have some recommendations. Agree that the Pyrenees are one of Europe's hidden gems, the Alps get all the attention, but the Pyrenees are incredible. Looks gorgeous! I love mountain scenery, although I know I couldn't handle as much hiking as you. Glad you had a good time! I've been hiking in the Pyrenees once and would LOVE to get back and do more - this one looks a good candidate! You've been on the MOVE, girl!! Gorgeous. I'd love to see you again! Gorgeous photos. I'm starting to share some of your fascination with mountains. Spain should be my next spot, can't wait! @Brandon - Can't recommend Spain enough. I was there 5 times last year and will be going back in April. While you could do it in as a long day, highly recommend an overnight trip, it's so gorgeous. If you don't stay in Vall de Nuria, then I recommend Girona which is closer and a great city. Hi, can i reach vall de nuria from barcelona? Is it possible if i visit vall de nuria only for 1 day, arrive at morning and back to barcelona at noon/nite? It's possible but it would be a long day. I'd recommend staying in Girona instead.